At a gorgeous bright morning, the presidency of university of Baghdad celebrated Christmas with Christian members at the university in an atmosphere of joy and delight, in the presence of the rector Dr. Alaa abdul Hussein, prof. Dr. Riyad Khalil, administrative assistant and some heads of departments at the university. A breakfast was served in hall of honor at the university president’s office where the attendants expressed their overwhelming happiness for this celebration which embodies the concept of brotherhood and friendly relations. The rector congratulated and blessed all members in this occasion and prayed for Almighty Allah that goodness may prevail on citizens and university members and its scientific edifices, towards further intellectual, scientific and academic development so that to continue its big victories in international classifications, most recently of which is the global recognition of the consulting engineering offices at the university by ISO International Organization. 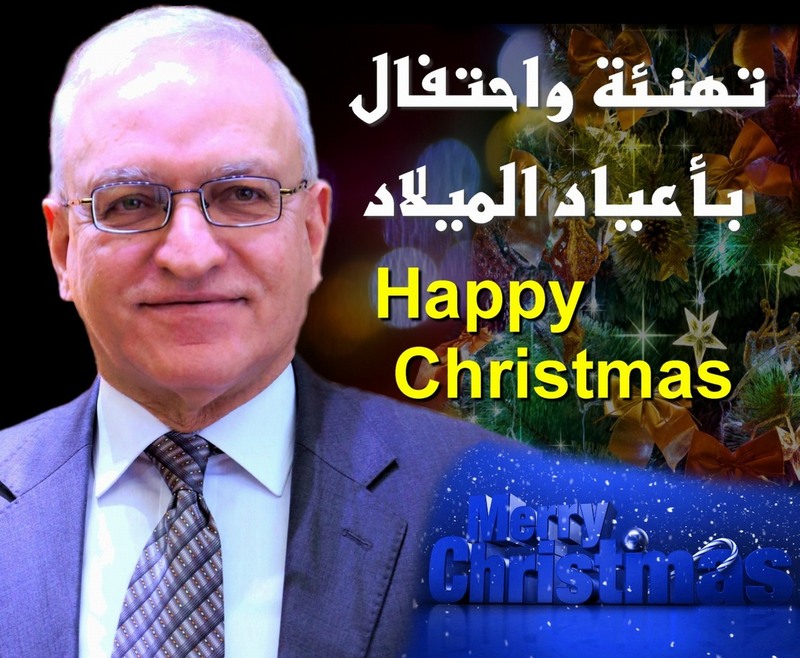 Prof. Dr. Alaa Abdul Hussein explained to the university channel office and the website that this celebration was for two occasions, to commemorate the birth of prophet Muhammad (PBUH) and the birth of Jesus Christ which emphasizes cohesion between Iraqi sects. Website team attended the celebration via its director Bassim Hamid Grimd, as well as the university channel director, prof. Dr. Abdul Basit Salman, for documenting this event through photos and videos. Confident strides and giant projects were made by the university in the midst of circumstances characterized by harsh challenges, so that the results would come according to an academic and intellectual development along with more events which shaped the victories of Iraq recently. 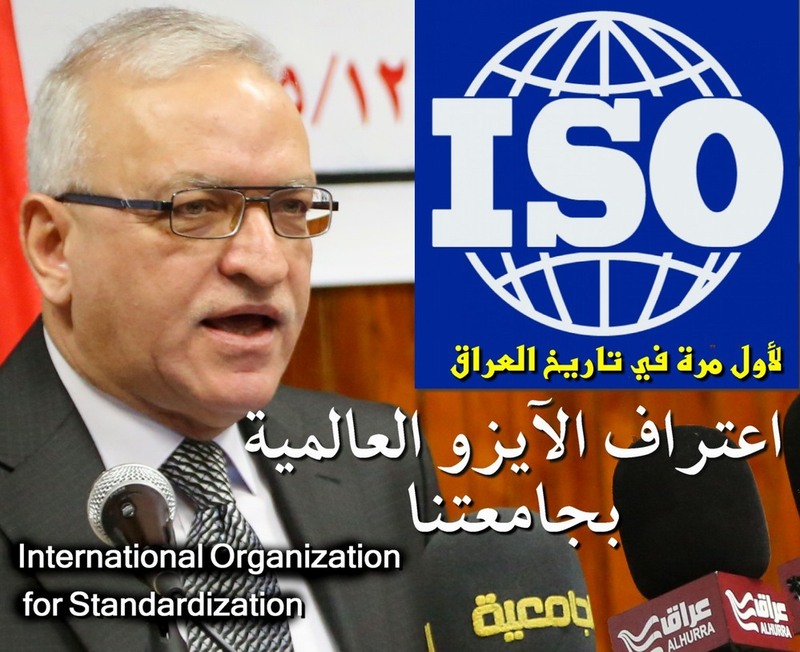 Today the university announces to all Iraqis and all the honest worldwide ISO recognition of the engineering consulting offices at Baghdad university as one of the global offices of standardization and quality control after many great sufferings in obtaining licenses for engineering projects in offices outside Iraq. In a gorgeous bright morning for our university and our nation, the Iraqi planning ministry celebrated a new achievement for Iraq and for the ministry of higher education, i.e, the central organization for standardization and quality control at the ministry of planning granted an international certification of ISO (International Organization for Standardization) for the labs of the advisory office at the college of engineering, in the presence of the university president, prof. Dr. All Abdul Husssein, deputy minister of planning, prof. Dr. Riyad Khalil, administrative assistant of the rector, dean of the college of engineering and a number of university professors and officials from the organization for standardization and quality control. It is worth mentioned that ISO is a standard-setting organization that includes representatives from several national organizations. It was founded on 23 February 1947 and addressed global trade and industrial standards and its headquarters in Geneva-Switzerland. Although ISO defines itself as a non-governmental organization, but its ability to set standards that usually turn into laws (either through treaties or national standards) makes it more powerful than most NGOs and it comprise a pact that has strong links with governments. University channel office team and website accompanied the celebration and documented in a series of video scenes and photos. Earnest endeavors and efforts are being exerted for providing the best qualitative services to the community through our university through its medical formations such as the faculties of medicine, pharmacy and dentistry, so that a new laser clinic is opened at the institute of laser for postgraduate studies. Prof. Dr. Alaa Abdul Hussein, president of Baghdad University inaugurates new medical clinics at the institute of laser in a ceremony attended by the council of the university of Baghdad in a bright and gorgeous day for the university and for Iraq. This event was also attended by instructors at the institute who were delighted for solemn services to citizens by using the latest technological equipment. 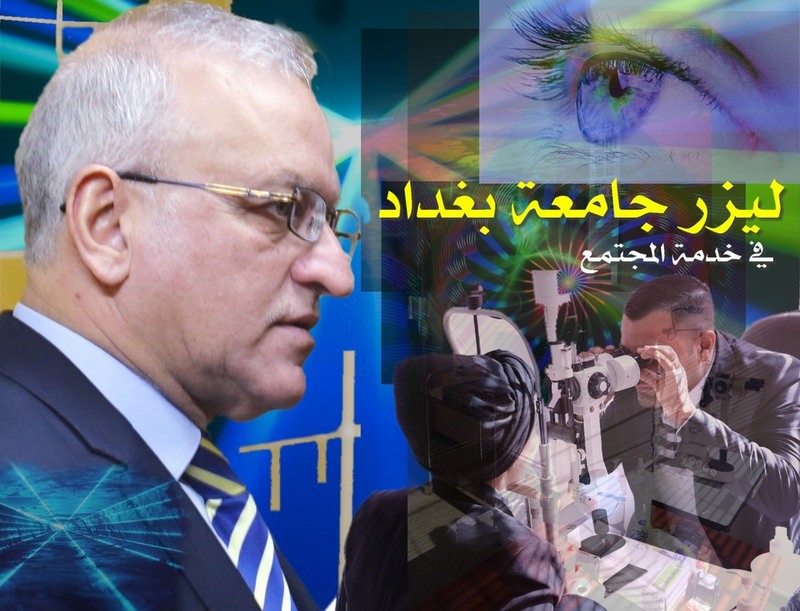 The university president stated in an interview for the university channel that the university continues its service to society under the banner “university in service of community” and that this institute treats many diseases and undertake cosmetic operations that were draining hard currency in the country and today thanks to Allah and with the benevolent efforts a new laser clinic is opened for ophthalmic surgery. Website team through its director, teacher Bassim Hamid as well as the university channel through its director, prof. Dr. Abdul Basit Salman accompanied this celebration in the presence of the director of the office of the university president and documented it with videos and photographs. University of Baghdad is like a constant spring full of colors and stripes since it includes various humanity and scientific departments, having cultural and media platforms besides treasures of creative artists. This is how the international artist, prof. Dr. Abdul Rida Bahia Dawood (Roudhan) project supervisor and professor of Arabic calligraphy describes our university when he held one of the most qualitative artistic exhibitions of calligraphy and ornamentation accompanied by top creative artists in the presence of dean of the faculty of fine arts, Dr. Qasim Munis, in collaboration with the department of artistic and sports activities, in an opportunity for students and professors to enjoy colors, fonts and rare typographic posters on the occasion of selecting Baghdad as one of the cities that produce culture. Prof. Dr. Alaa Abdul Hussein, president of Baghdad university inaugurated this exhibition and praised the exerted efforts of all involved, calling for expanding the size of such exhibits that include rare antiques that reflected the possibilities and capabilities of the Iraqi mind and he expressed his thanks and praise for the show and he stressed the importance of giving support Arabic calligraphy and ornamentation that form graduation projects of students. It is worth mentioned that the dean was keen to hold such a fair at the university unlike the previous years where it was held at the held at the faculty of fine arts. The opening was attended by prof. Dr. Riyad Khalil, administrative assistant of the rector, Dr. Osamah Fadel, scientific assistant of the rector, Dr. Mohammed al-Rubaie, director of artistic and sports activities, prof. Dr. Abdul Basit Salman, editor-in-chief of the university website, the website and the office of the university channel teams for documenting this event with a series of videos and photographs.